The HSLS Rip Optimization System is one of the most simple yet accurate optimizing systems in the industry. 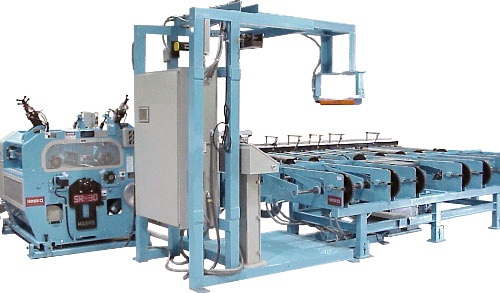 It is designed to increase board yield while decreasing labor costs. The HASKO HSLS is a simple yet robust, cost-effective, rip-to-width solution that can improve overall yield and lumber utilization while optimizing production. It is ideal for flooring, moulding, dimension, and other straight-line, rip-to-size operations for high-production, fixed-arbor, straight-line, rip-to-width optimization. Hasko offers multiple board rip optimizing solutions. We have multiple automated features that enhance your board yield while reducing labor and improving safety. Hasko offers both Fixed saw ripping on the Hasko SR-Series Gang Ripsaws. The Hasko SRMA with patent pending saw shifting technology for up to 5 moving saws. The Hasko HSLS Board scanning system uses one scanning position to determine the board width and side bow. Optional automatic board flipping and automatic side bow busting is available with cupped board detection. The automatic bow busting will only cut boards when the cut will improve the board rip combinations. The busted boards remain in the system and the Hasko HSRF rip feeder will manage the cut boards into the saw when the fixed saw system is used. The Hasko SSGF is used when the Shifting saw system is utilized. We offer turn- key systems from the package deck to the rip sorting system or we can design our machinery into your existing lumber delivery system. Whatever your needs are, let us demonstrate what Hasko can do for you.